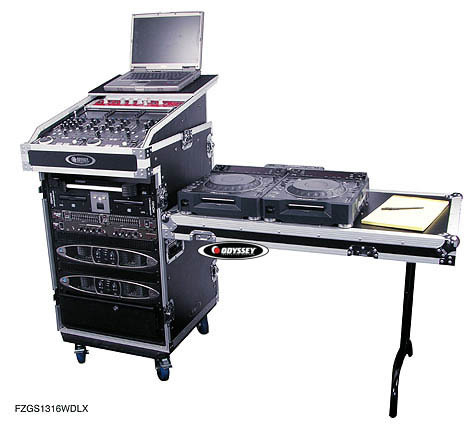 Odyssey FZGS1316WDLX Glide Style Combo Rack DJParts - All Variety of Parts that DJ Needs. Glide Style Combos feature our patent pending sliding laptop platform mounted above a 19" ATA case. At your gig, set your laptop on the carpeted surface, plug in and you're ready to go. Slide it forward to use your laptop. Slide it back to use the mixer section underneath. Keep your laptop close and safe on a sturdy new Glide Style Combo case. NOTE: This case is not designed to transport your laptop. Detachable lid included (not shown).